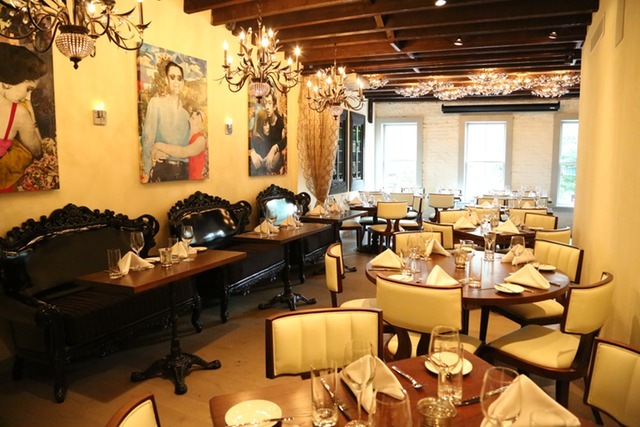 Kosher fine dining enthusiasts have been anxiously awaiting today's launch of the newest of NYC kosher restaurants, Jezebel. Located in Soho, this is a "sophisticated, modern American fare 'that happens to be kosher'," according to owners Henry Stimler and Menachem Senderowicz. Award-winning chef Bradford Thompson put together their eclectic and diverse menu. A lounge downstairs seats 50, while the upstairs dining room has room for up to 100 chosen diners. The main bar upstairs is, we're told, "overflowing with fresh herbs and composed of black leather, is punctuated with alternating high-gloss black wood fins and back-lit white onyx panels, and boasts over 300 floating bottles of wine." All the artwork in the joint was commissioned from "young" New York artists, and plays off a Jewish theme, superimposing Jewish "icons" on famous portraits. In addition to the Woody Allen last supper, Jezebel also has a painting of Mayor Bloomberg as George Washington. Jezebel is under the Supervision of Rabbi Melhman. 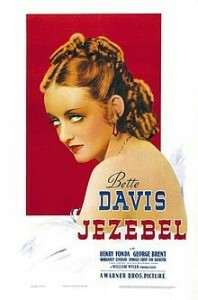 The name for the restaurant is after the 1938 film named Jezebel, starring Bette Davis. Call (646) 410-0717 to make a reservation. Please comment below with your reviews and thoughts about this new restaurant.